The Nipmuc tribes of Massachusetts were not ocean-going people - that they left to the Pequods who lived along the coast of Connecticut, and the Wampanoags who lived along the Massachusetts coast near Plymouth. Instead, the Nipmucs enjoyed the lakes, rivers and streams of central Massachusetts. The Nipmucs used bows and arrows to take down deer, wild turkey and other game. They fished in the lakes and streams. Much of their diet was based on growing corn, squash and beans. They also enjoyed wild berries and maple syrup. Nipmucs lived in small villages, in wigwam, or "wetu", homes. 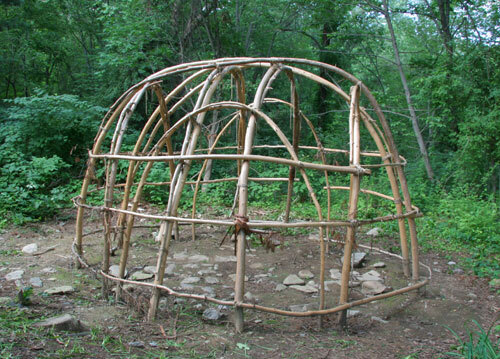 Wigwams were built with a frame of saplings, bound together to form a roughly semi-circle shape. The wigwam would be covered with reed mats, blankets and hides. A hole was left open at the top for the smoke to go out. In a village, a collection of wigwams would be arranged around a central area where the community would gather to talk and dance.